Update: Yoko did make it out of the high stream section when the weather cleared yesterday. A couple that had stayed at the lodge walked out with her saying she was tired and wet, but improved as the day warmed up. They walked out with her and helped her through the crossings. Yay! I was up early at 6am with the birds welcoming another day. I wrote yesterday’s blog post and got some other things done that were backlogged from the last leg. I woke Becky just before 8am and she was out cold. She hasn’t been feeling great, and it’s tough to know if it’s a cumulative tiredness of the hike, or if she’s sick and might have the flu or something. Her stomach and head hurt yesterday and all day today. It made for a rough day. We are just three fairly relaxed days from our double zeros planned in Wellington, and she’d really like to get there before taking a day off. Wellington is the endpoint of the North Island, so there’s a “finish line” kind of feeling to make it there before taking days off. So close to resting! Carol gave us a ride back to trail, and on the way was nice enough to stop by a place that Becky could get some shoes for cheap to wear the next three days to Wellington. Her Solomons got shredded quickly on the mesh on the toe box, and just got too bad to stitch. Most hikers are having to stitch the mesh on their shoes as that’s what’s going well before the tread, but if you don’t catch it early enough, the holes can get big fast and rip across the whole top like Becky’s did. She was able to find cheap ones to get her to Wellington where she has her new pair of trail runners waiting for her. Of course this is where someone’s going to give me a lecture on why trail runners aren’t sufficient for NZ trails. Well, they are just fine. You just need to keep on top of the mesh sewing if it rips. Most TA hikers are wearing them just fine and prefer them. My first pair lasted even longer than they have on some US trails. 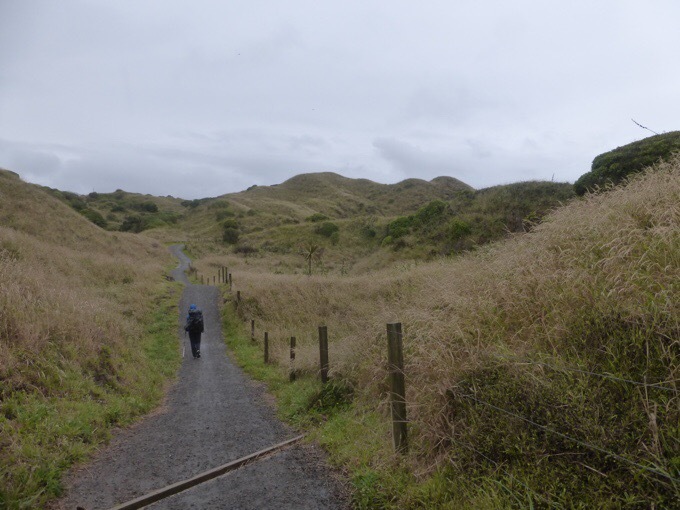 To each their own and no need to criticize…and yes, I’m well aware of what the S Island holds with a lot more hiking like the Tararua Range. We got to walking around 10am. Today was pretty much along the coast for the day. It was gloomy, and a steady light rain all day. That really didn’t help the already deflated mood of Becky having to walk in a body that wasn’t having it today. Good news is that it wasn’t cold or windy, so it could’ve been much worse. I was easily dry with the umbrella attached to the pack all day. 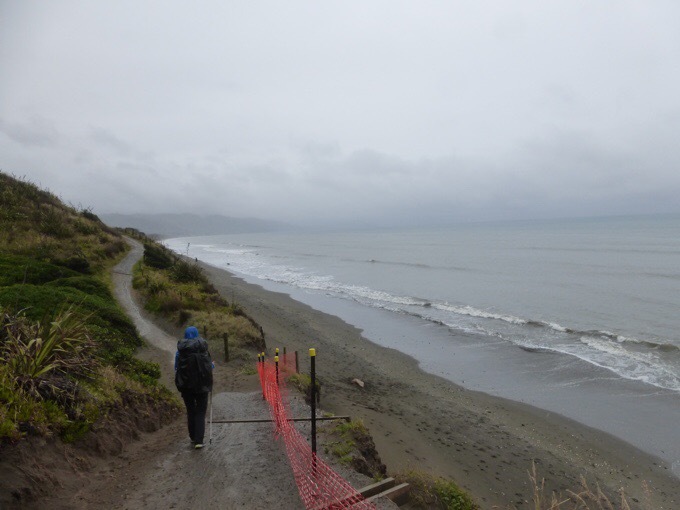 We started off with an hour or so on a river and estuary walkway that led to the beach. The beach walking was nice and firm, so it went by easily. It was nice and relaxing all day, which was greatly welcomed after the last week of more tiring hiking. 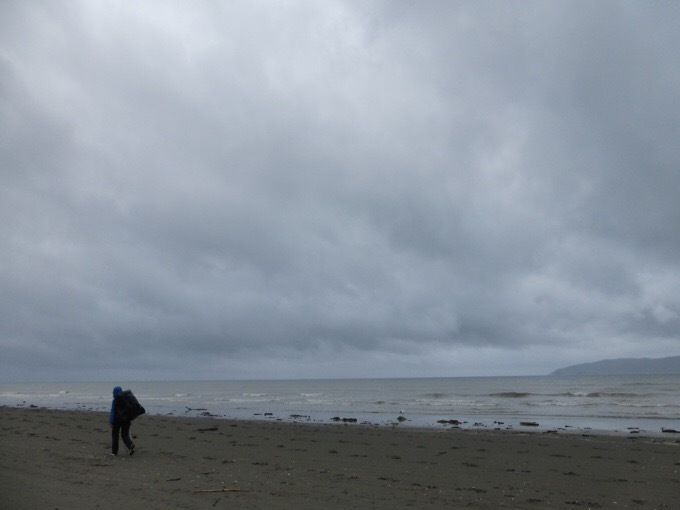 The tide was high, so we did have to go up to the road for a couple kilometers. We ended up walking by Carol and Ray’s at lunchtime, so we stopped by to eat our lunches in the house and out of the rain. Again, THANK YOU Carol and Ray! 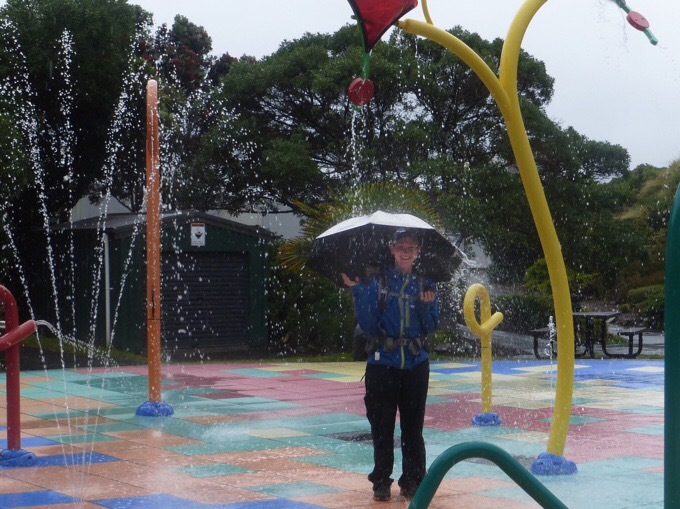 It is summer here, and we walked by a local water park, which was odd to see in full effect in a steady rain. 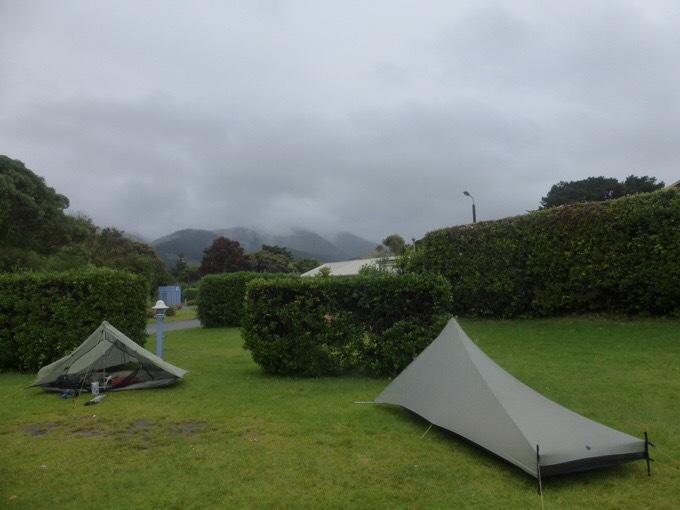 At lunch, we decided that it would be best to do a shorter day today and end at the Paekakariki Holiday Park. There were many factors including weather, timing for a stretch that will be better to do tomorrow, giving Becky time to rest, and just nowhere else to really camp legally. We did a couple more hours after lunch and hiked along a wall at high tide with waves splashing up from time to time that kept me entertained. 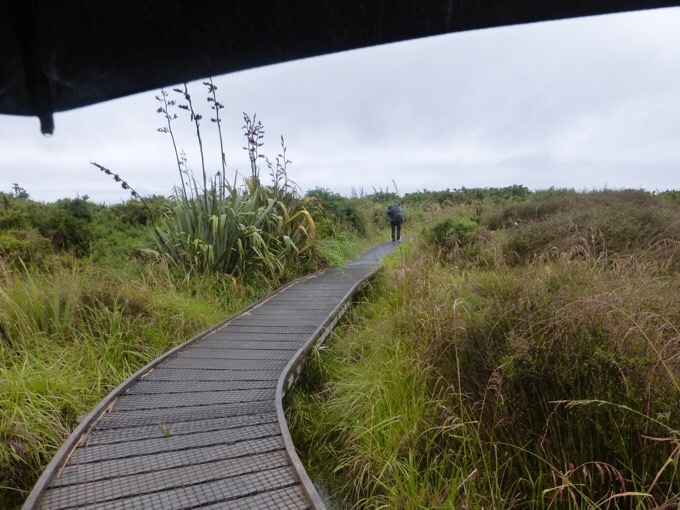 Then there was a nice coastal walkway that was just inland a bit in the dunes. 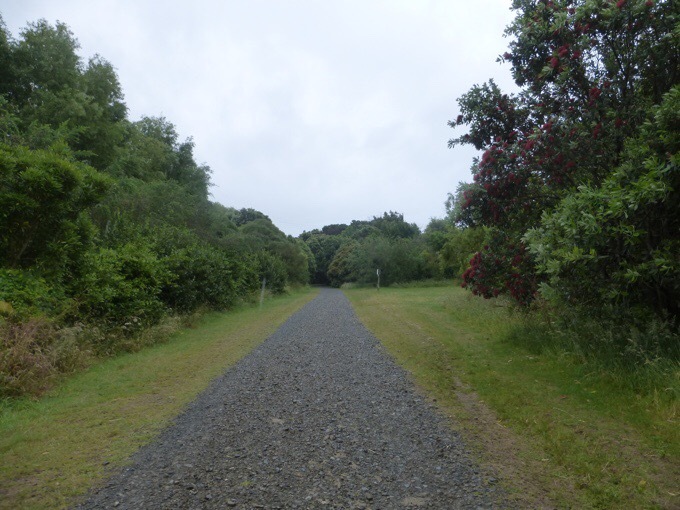 I expected tiring sand slogging, but it was a great compacted gravel path. Very enjoyable. We got to the Holiday Park at 3:30pm. It didn’t take long for Becky to get her tent up and sleep most of the rest of the day. Poor thing was totally out. Once I laid down and the rain was on my tent, I was tempted to doze off as well. The rain did clear in the evening. I ended up doing some reading up on the South Island I’ve been procrastinating. We will need to send two boxes it seems (St Arnaud and Arthur’s Pass), so it was good to get details on that figured out. I hate doing planning, but that’s one less thing to do during the Wellington zeros! I also did some more looking ahead and I saw that my friend Why Not had 18 zeros on the South Island. 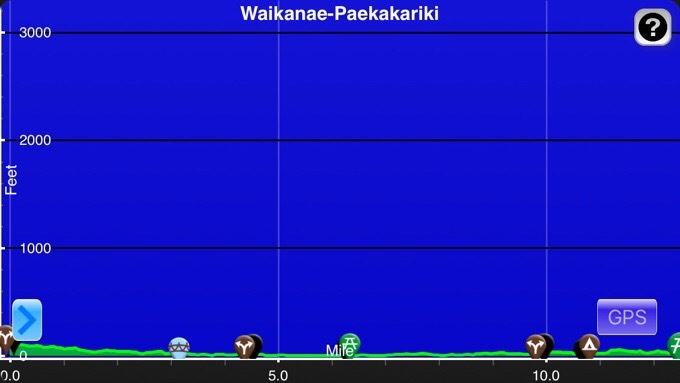 Most were due to weather she had to wait out similar to what we were able to dodge in the Tararua Range. 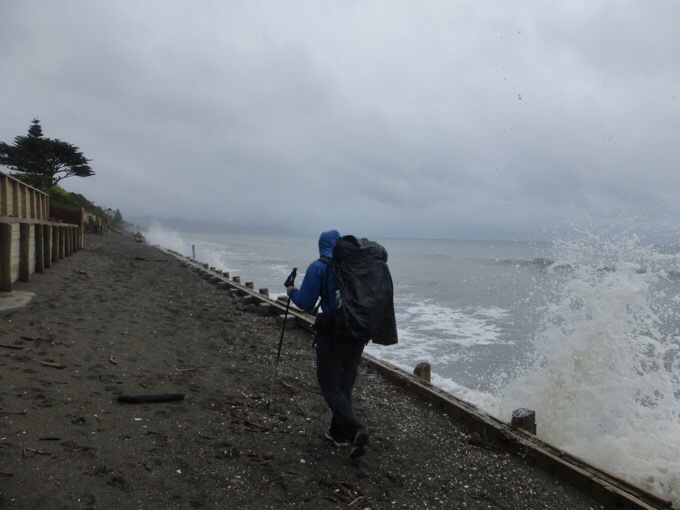 The South Island will be like doing consecutive Tararua Ranges, and many will require waiting for clear weather windows. A goal for me in Wellington is to load plenty of shows for when those zeros come! Speaking of shows, I did get to watch an episode of Mozart In The Jungle, and that was relaxing. Ok, hopefully a less gloomy day tomorrow and hoping this rest helps to give Becky the energy for the final two days to Wellington! That sort of weather would really sap my morale. Poor Becky, hope she feels a little better tomorrow. Not good to be sick on the trail but nice to have a companion to boost your moral. Hoping for a better day for you tomorrow and that Becky will wake up feeling good. Great news about Yoko. Hope Becky bounces back. And I would never presume to tell a person of your extensive experience what gear or shoes to choose. Go get ’em wired! Did look like a tough day if you weren’t on your game. Hope the long night sleep benefits Becky well. You gotta keep the young’uns going ma!! jk of course. At least both of you aren’t down-n-out at the same time. She now has daily vitamins with iron to take like me! Not so much of a “perfect” day…hope tomorrow is sunnier and healthier! Been hiking in the South Island since the early 1980s in trail runners, in fact doing it now, and it’s worked for me. Enjoy your days off in Wellington. Mama, Google the Barefoot Sisters .. they did the Appalachian Trail ?. There is a book, maybe two.. quite entertaining. Good to know barefoot treks are still happening, though I don’t choose that even at home. Yep! I know of them! Hey Wired and Becky, congratulations on making it through the Tararuas and welcome to Wellington. Sorry the weather is so dire – its normally better than this. Think you said you had friends to stay with in Wellington, but the offer is still open for you both to stay with us in Paremata. You will have walked past us on the way to Camp Elsdon from Paekak. Are you OK for gear? Read that Becky has new shoes waiting for her. I work in town and could meet you at an outdoor store to buy you anything you need for the South Island leg. Just email me. Consider getting a shoe repairer to glue a reinforcement piece of thin leather or synthetic on the inside of the toe box on your next new pair of shoes – before even using them. It makes almost no difference to weight, but is perhaps slightly stiffer and runs a bit hotter but it stopped my regular runners from splitting the mesh and killing the shoe. The mesh now outlasts several heel repairs and the sole. The fragile mesh on many runners is better suited as lace on knickers – manufacturers seem to have little idea. Asics used to pick up the cost of this and also all my all too regular heel repairs for many years – to meet their endurance claims of 800 to 1000 kilometres. Best wishes to you both on your journey. Thanks for the tip Don. That’s great advice as the mesh on my runners is usually the first to go as well. Yep, many do carry the shoe glue and that has worked for them along with stitching. Hey erin! Would you mind elaborating on why you picked St. Arnaud and Arthur’s Pass as the two food drops you are going to do? What is your plan for resupplying in Boyle Village? As a newbie, I would appreciate hearing your reasoning! I will talk about it in more detail in future posts, but good question. First off, I hate resupplying and sending boxes. I heard Havelock has a Four Square that will be pricey, but fine. 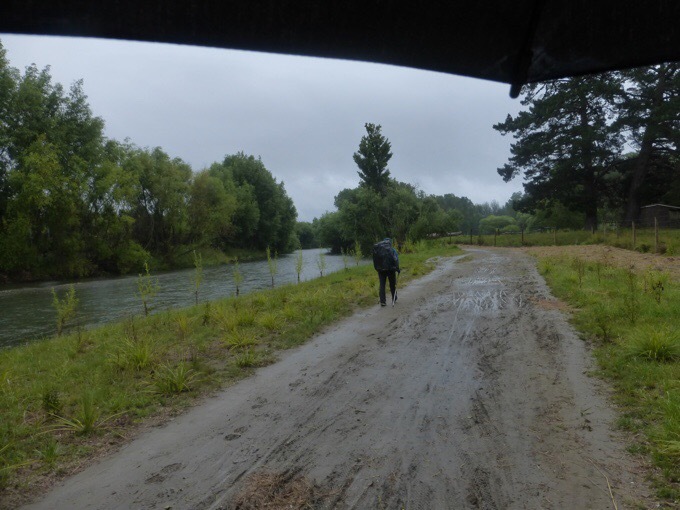 As for Boyle, we will just hitch the 55km to Hamner Springs where we can enjoy a possibly needed break (they have hot springs people like too). My friend last year really needed the break at that point and the hitch this year is quite easy as main traffic has been routed that direction due to road closures from the earthquake. If I was in a hurry and not concerned with relaxing, I’d send to Hamner, but this trip has become more of a vacation and I know it will be a boost for Becky to drop into Hamner after a possibly tiring leg.